This year, Bank J. Safra Sarasin is proud to celebrate 30 years of Sustainable Investments. J. Safra Sarasin does not view sustainability as an end in itself, but rather as a key factor in its success. Sustainability enables the Group to project a distinctive image on the market and creates continuity across time and generations. J. Safra Sarasin is committed to operating its core business in a consistently sustainable manner. This is a commitment for the future. The associated principles and rules of corporate governance provide the framework for every aspect of our business activity. The sustainability strategy is strictly implemented at management and operational levels in order to ensure credibility and reliability. For J. Safra Sarasin, Corporate Sustainability means responsible and proactive governance, considering and integrating the interests of all the Group’s stakeholders into its decision-making process. 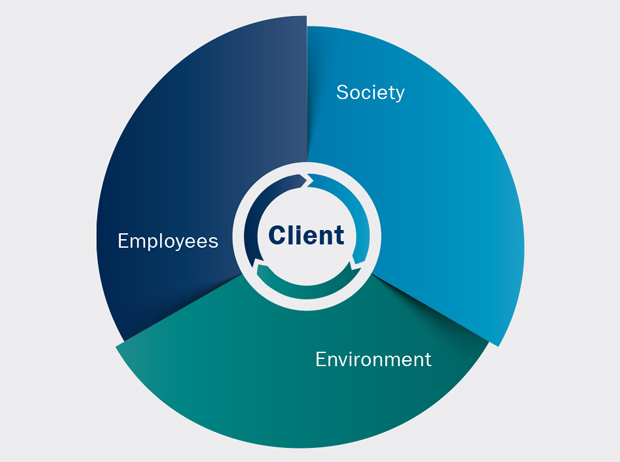 Focusing on its clients, while balancing the needs of its employees as well as the requirements of the society for long-term prosperity and the integrity of the environment, is paramount for the long-term strategy of the Group. From this understanding, J. Safra Sarasin has developed five strategic Corporate Sustainability objectives. UN Global Compact "Tour de Suisse"
To showcase how "Sustainable Business is Smart Business", Bank J. Safra Sarasin and three other leading Swiss sustainable companies were put under the spotlight in a documentary film. This short movie explores how the companies’ commitment to sustainable operations can create opportunities for innovation and valuable business models while mitigating risks and overcoming challenges.